In Dallas, Texas, and other areas, termites and carpenter ants are often mistaken for one another. The carpenter ant is a wood destroying insect, but they do not actually eat wood like a termite does. Carpenter ants damage wood by chewing into it to create homes to nest in. The key to carpenter ant removal is locating the colony and treating it accordingly. Our pest control professionals perform a thorough inspection in and around your structure for carpenter ant damage. You will notice that we inspect all areas that are conducive to carpenter ants from the ground level to the roof peak. They often locate their nests inside walls or ceiling voids that are not easy to get at, so expect a thorough and possibly lengthy inspection. Sometimes an evening inspection is necessary to locate a difficult carpenter ant problem because they are most active at night. 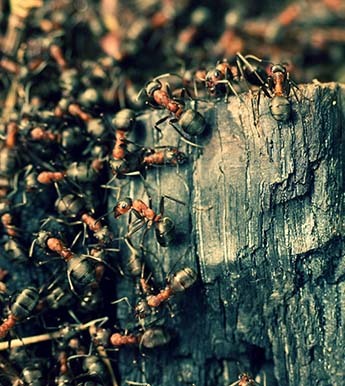 Once we perform a thorough inspection, we’ll offer recommendations to treat the ant infestation and stop the carpenter ant damage from going any further. Contact our pest control professionals to schedule an inspection of your home for ant damage.